Jaafaripour Maybody, J., Nemati, A., Salahi, E., Amin, M. (2010). Effects of MWCNTs Dispersion on the Microstructure of Sol-Gel Derived Hydroxyapatite. International Journal of Nanoscience and Nanotechnology, 6(2), 114-124. J. Jaafaripour Maybody; A. Nemati; E. Salahi; M. H. Amin. "Effects of MWCNTs Dispersion on the Microstructure of Sol-Gel Derived Hydroxyapatite". 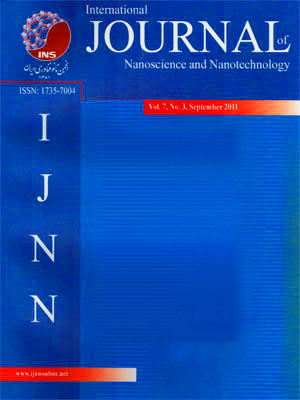 International Journal of Nanoscience and Nanotechnology, 6, 2, 2010, 114-124. Jaafaripour Maybody, J., Nemati, A., Salahi, E., Amin, M. (2010). 'Effects of MWCNTs Dispersion on the Microstructure of Sol-Gel Derived Hydroxyapatite', International Journal of Nanoscience and Nanotechnology, 6(2), pp. 114-124. Jaafaripour Maybody, J., Nemati, A., Salahi, E., Amin, M. Effects of MWCNTs Dispersion on the Microstructure of Sol-Gel Derived Hydroxyapatite. International Journal of Nanoscience and Nanotechnology, 2010; 6(2): 114-124. Stable homogeneous dispersions of carbon nanotubes (CNTs) were prepared using ethanol as dispersing agent. Then, using sol-gel method, dispersion in the hydroxyapatite matrix and its effects on the microstructure were investigated. The phase composition, chemical structure and morphological and size analyses were performed using XRD, FT-IR, SEM, TEM/SAED/EDX and Raman spectroscopy. The influences of different dispersing agents (sodium dodecyl sulfate (SDS) as a benchmark for future dispersion experiments) and excitation wavelength are discussed and the results are compared with the commonly used UV-Visible spectroscopic analysis. The results indicated that the synthesis of hydroxyapatite particles in the presence of carbon nanotubes had the best effect on the homogenization of carbon nanotube dispersion. The average crystallite size of heat-treated (at 600°C) samples, estimated by Scherrer,s equation, was found to be ~50-60 nm that was confirmed by TEM.